Great Product. Heed Installation Instructions! I have had this protector (MXH version) on my computer for a few days now. It is a very high quality, well made product and easily worth the twenty or so dollars. As far as I can tell, there is no change in screen quality. There is some very minor glare and only under the worse conditions. You really can't make a better aftermarket anti-glare screen cover as far as I am concerned. It does exactly what I expected and wanted. But please note: Installation should be taken seriously! Make sure you allot at least an hour if you are a perfectionist. I am sure installation is much easier on a nice mac computer that is completely flat and does not have a keyboard attached to it. The macbook, however, is a little bit trickier because of the angle of the screen and the nature of having to work around the keyboard. Also, pay attention to dust! Aligning the protector correctly took me 2-3 tries, but by then there were a couple of bubbles from dust that were a serious pain to get rid of. I would ideally put this on a brand new macbook that has not collected any dirt or dust OR get extra anti-dust clothes and cleaner and really prep your work space. Photodon supplies one cleaning and one lint-free wipe which helped, but if you have a dirty macbook, add an extra 30 minutes to prepping your workspace and macbook. It will save you a lot of time and struggle in the end. Awesome product. East of installation definitely depends on the product if you care about perfect alignment. Pay attention to prepping your installation space and product! Get gloves, a nice exacto knife, and really take your time. You'll be happier in the end. Thank you for such a thorough and helpful review, Ahmed! We do sell and deluxe installation kit called MX101. 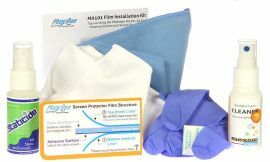 It contains Staticide and Photodon screen cleaner plus some microfiber cloths -- all of which are helpful to have around the home or office after installation. I've had it for about two weeks and I love it. Makes the macbook a lot less annoying to use in bright spaces. Does not take away colours or screen brightness. In fact, I didn't notice it at all. Only bad point is that it doesn't fit 100% on the area around the screen but it's still easy to apply and can be applied bubble free with patience and a bit of luck. Great product!